No I’ve not got a proper job, but I’m training like I should be and enjoying it. A week on Lanzarote has seen some big days backed up against each other and a lot of work on the bike. This is a place where easy riding doesn’t really happen if you’re not going up a hill there’s a headwind to hammer you instead. Usually you’re dealing with both. I spent the first half of the week chasing after Steven on the bike. I like to remind myself what good training it is just me into the wind constantly motivated to try to catch up. Usually I’m reliant on him stopping on the top of a climb for that to happen, but I did have my moment on the highway back from Mirador Del Rio the other day! The second half of the week has been spent chasing both Steven and Mark Racher. I’ve been coaching Mark for a while now and it’s great to actually train with him. Apart from an amazing swim pedigree he’s strong on the bike. Here I am with tired legs and someone new comes along to put the hurt into me! I can’t complain as it’s a good sign he’ll be in great shape come Ironman UK. I’m probably coaching someone to beat me at Kona this year! After three days of long, tough rides it was time for an easy day. Easy translating into double runs. I’d have been happy to do two one hour runs, but Mark enjoyed the first one so much he was keen for two hours in the afternoon! It was another trip down to Playa Quemada along the coastal trail and up the hill to the pylon. If he was going to have me running for three hours I’m was going to make him run up the steep hill! With the luxury of such a casual day’s training we’ll be back out for another three days of solid riding. More hills, more wind and more hours in the saddle. I’ll be aiming to keep up the strong riding form I’ve been showing the past few days. My concerns about fitness have largely vanished. I may not be able to catch Steven (or Mark), but I’m riding harder than I’ve ridden before. To prove the point a chart. 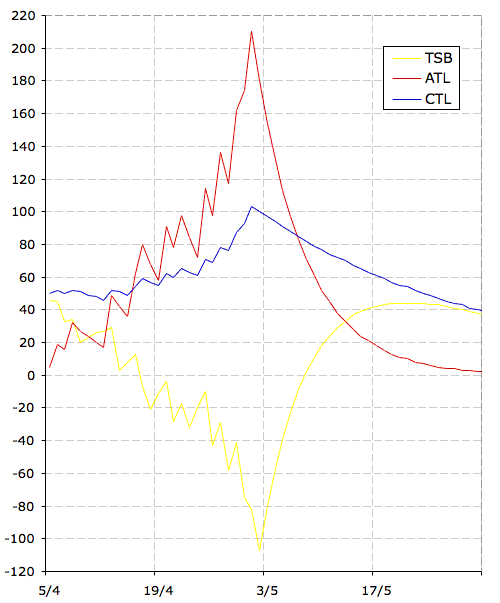 My power distributions from three periods of time over the past year of training. 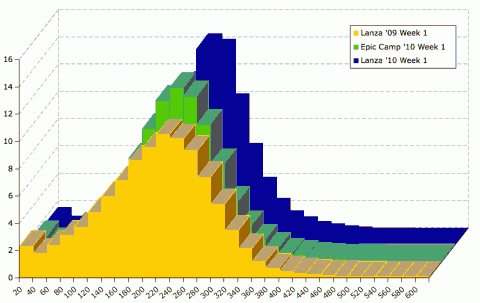 I’ve picked my first week out in Lanzarote back in 2009 (yellow), the first week of Epic Camp this year (green) and the past week (blue). The chart shows the percentage of time spent at different wattages. Simply put the more time I’m spending at higher wattages the fitter I am on the bike. I produced this chart at about 1am this morning when I couldn’t sleep. Having held suspicions that I was stronger on the bike I wanted to test them out. 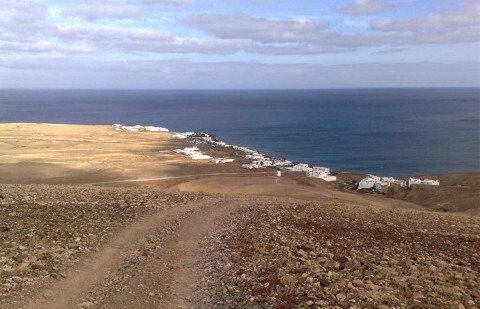 I figured Lanzarote last year was a good comparison with Lanzarote this year as conditions were likely to be similar. Epic Camp was a block of hard work where I had the motivation of a large group and would say I was performing near my best. 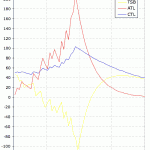 From the chart it’s clear that my current training is seeing a lot more time spent at higher wattages than before. I think it needs to be noted that on Epic Camp I was riding for about 35 hours in the first week, whilst I’ve only ridden for 26 here. Last year I only spent 20 hours on the bike during the first week in Lanzarote. Whilst I could see some argument that the additional ten hours riding in New Zealand might have left me too tired to work so hard it’s not the case for the previous year here. I’m seeing it as a really good sign that my cycling is improving. I’ve been working a lot harder here, maintaining both a higher power and a higher heart rate. The initial excessively high heart rates have vanished and I seem to be settling into my usual pattern. Holding what I consider to be race intensity (at least previously) is more manageable though not necessarily easier. I seem to have the motivation to keep pushing a little bit more. The cost of this is a humungous dip in my TSB in fact I’ve surpassed Epic Camp New Zealand with a new all time low of -106.5! Despite this I still felt I could go out and ride today the running just seemed a more pleasant option! It may be a while before I see positive bike TSB again, hopefully somewhere around race day so I’d better get used to pushing through this.